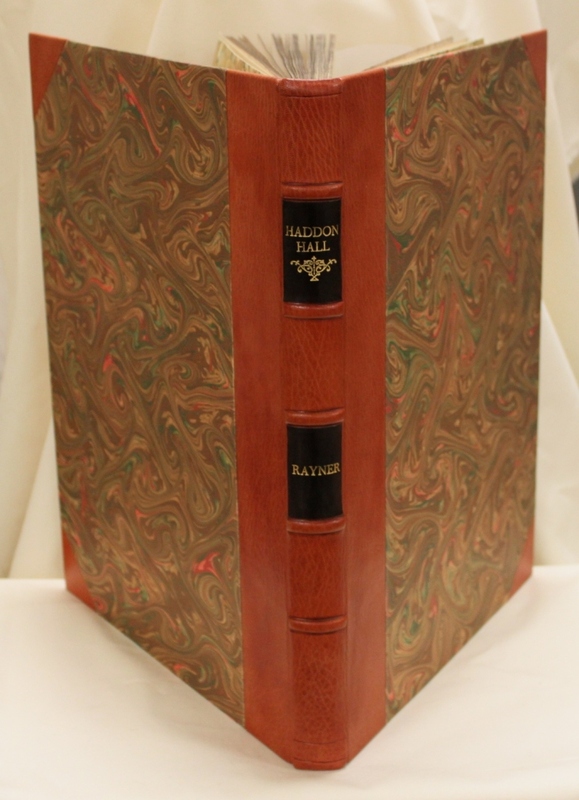 Derby Museums has purchased the book ‘The History and Antiquities of Haddon Hall’, by Samuel Rayner. The book contains ‘thirty two highly finished drawings with an account of the hall in its present state’ and was published in 1836 by Robert Moseley, Derby. We bought this book last year but it was in a pretty poor state. Since then Matt Edwards has been busy conserving the book and has rebound it. 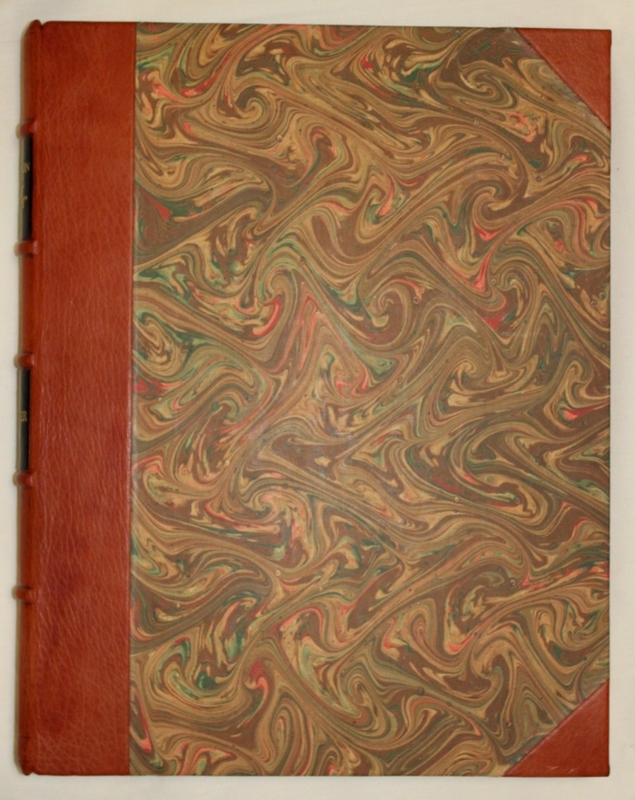 The book suffers from a bit of of foxing and has been damp at sometime in its history, but atleast now it is stable and looking much better. This book was the first book to be published solely on the subject of Haddon Hall and it contains details about the history of the building, the families that owned it and descriptions of the rooms and gardens. It also brought the legend of Dorothy Vernon’s elopement with John Manners further into the mainstream. Dorothy was born around 1545 and was the daughter of George Vernon, the ‘king of the peak’. She married John Manners, inherited Haddon Hall and the estate passed out of the Vernon family’s hands. This sounds straight forward but there has been much debate about their marriage, mainly centered on whether they eloped or not. For more info see David Trutt’s Haddon Hall website. What does seem to be true is that this story was embellished by the 18th and early 19th century caretakers and guides of the then uninhabited Haddon Hall. Samuel Rayner talks about the guide William Hage ‘who long had the care of the house and gardens here, and the office of guide to the visitors’. The door that Dorothy eloped through and the ‘Love steps’ were pointed out and feature in quiet a few of the travel writings of the time, including as illustrations in Rayner’s book. The legend would later be told in various novels, and on stage and screen. You can download PDFS of the text and illustrations from Samuel Rayner’s book from David Trutt’s Haddon Hall website. Samuel Rayner was the head of a very artistic family. His wife Ann produced Ashford Black Marble diamond engravings– like the one we were outbid on – and their children included Louisa and Margaret Rayner who were also both talented artists. The whole family painted at Haddon and you can see some of their work here. Buxton Museum and Art Gallery has bought a watercolour of the New Bath Hotel in Matlock Bath. 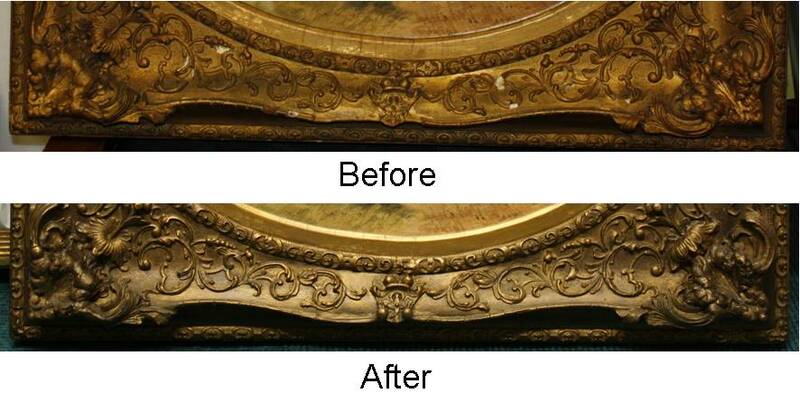 The picture was sold to the museum by a private seller and has just come back after undergoing conservation work – check out the before and after photos below. 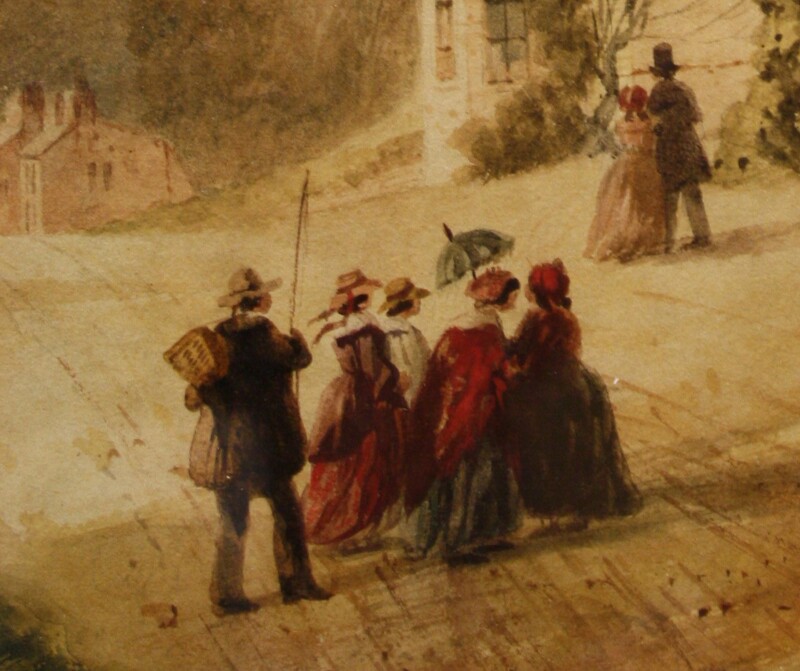 The watercolour shows the front of the hotel, a rather windswept looking fir tree and groups of visitors – complete with the ubiquitous angler that graces so many Derby shire scenes. The sign on the gable end of the hotel reads ‘Saxton’s New Bath Hotel’. George Saxton and his son (also George) owned the New Bath Hotel from around 1797 to the 1850s. 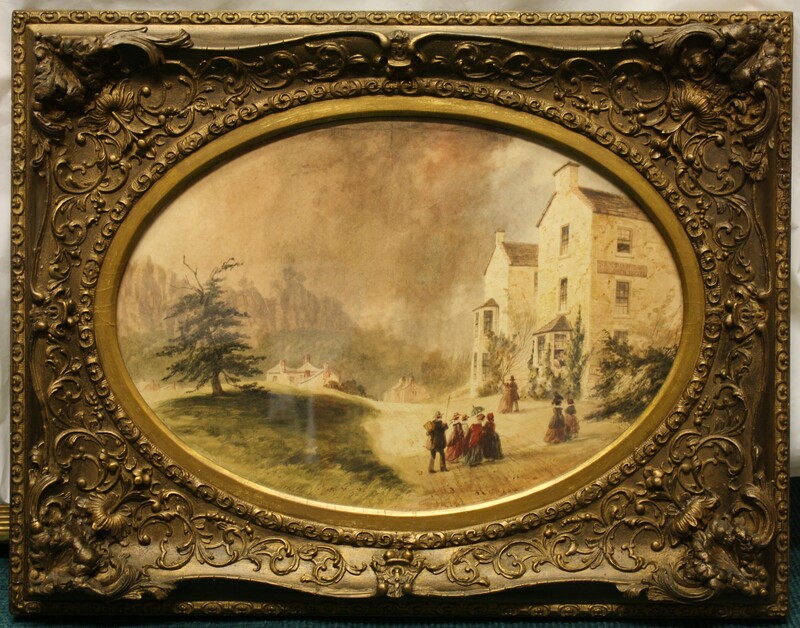 During this period Matlock Bath was a burgeoning tourist town attracting visitors with its warm medicinal waters and rocky picturesque setting – you’ll see the watercolour shows the hotel against a backdrop of limestone cliffs. Matlock Bath had many hotels and boarding houses but ‘well to do’ visitors would stay at either the New Bath Hotel, Temple Hotel or Hodkinson’s Hotel. The three hotels had the same tariff and in 1819 they charged 5s a week for a bed chamber, 14s to a guinea for a private parlour and bathing was 6d a time. Each hotel would have also provided post-chaises and horses for excursions to local beauty spots. Dr. Granville writing in ‘The Spas of England’ in 1841 considered the New Bath Hotel the best of the three with the decorated ball room being its main attraction. Benjamin Bryan in his 1903 book ‘History of Matlock’ describes the hotel as being ‘finely placed, has been thoroughly modernised, is luxuriously finished, and admirably managed’.